Is your bad credit catching up to you? Are you sick of the collectors calling, and harassing you and your family? Our Partners can help you make it stop NOW! We can give you the facts you need, so that you can make the right decisions when it comes to your debts! You have debt options and may be able to avoid bankruptcy! Debt Settlement, Debt Consolidations, Orderly Payment of Debt, Consumer Proposals and bankruptcy services are all available through partners. One size does NOT fit all when it comes to your credit and debt matters. Let us point you in the right direction! Best of all Canada Credit Fix is 100% Canadian owned and has offices in Canada. All of our partners have office in most Canadian cities to help service your debt solutions better. Our Partners can stop the harassing phone calls and help get you back on your feet. Reduce your monthly payments, and make life affordable once again. Our experts will monitor and manage your credit while you are in the process of restructuring your debts. Once you have completed your debt settlement program, we will be there to help you rebuild new, healthy and responsible credit. Call us today and find out your best debt settlement option. Find you what your payments may be. *All values are an estimate, and may vary. ** based on 36 month term. Get Out of Debt through our Partners. Tired of being smothered by overwhelming debts and interest? Get out from under the weight of crushing consumer debt with reliable, effective debt help from Canada Credit Fix and their partners. 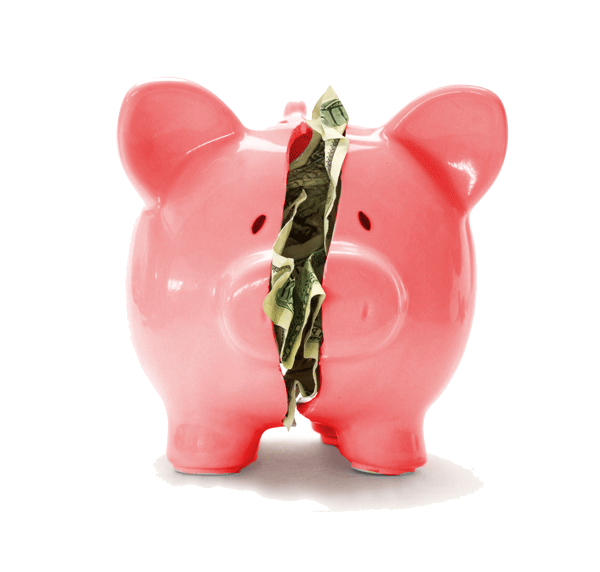 Debt problems can happen to anyone, and often unexpectedly. Whether you’ve suffered an illness, job loss, divorce or other unforeseen circumstances you can feel confident knowing that when you need to get out of debt, help isn’t far away. We offer solutions that are different than any other company in Canada. Our Partners have over 50 years of experience helping people get out of debt, with manageable, effective solutions that really work. Their personal financial recovery services can help you learn to take control of debt and understand debt options; while we assist you with all of your credit matters and the rebuilding of your fiscal livelihood. Take the first step to get out of debt now by contacting us now! 100% FREE consultation 1-866-530-3646 toll free. Our Partner Programs Offer Services to Help You Get Out of Debt. Get advice and counselling from highly knowledgeable and experienced professionals. We provide solutions to help you get out of debt in a safe, non-judgmental atmosphere. Once you get out of debt, you still need to learn how to stay out of debt and rebuild credit. We can help you learn to create a household budget and begin managing debt more effectively, while re-establishing healthy new credit. A consumer proposal gives you the time and the terms you need to pay some or all of your debts, protect your assets, avoid bankruptcy and get out of debt faster. This program is an easy and fast solution to help get you back on your feet. Our partner debt programs allow us to help rebuild and protect your credit even while in a Consumer Proposal. Our partners allow us to work with you in the background insuring that your credit is reported properly, and accurately while we monitor your credit rating. Most importantly, we make sure you are being treated fairly and insure that the all of your creditors remain in compliance with legislation. Canada Credit Fix is representation that you can count on! While filing bankruptcy may seem like an extreme way to get out of debt, the professionals we work with can help calm your fears, answer your questions and and help to financial stress. 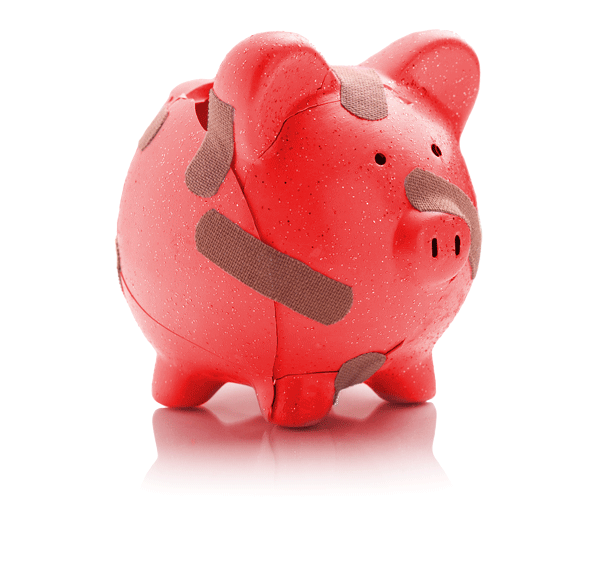 Financial difficulties can be stressful, but we are here to answer your questions and help you get out of debt. Let us help reduce your debt-related stress and get on the road to financial stability. With Canada Credit Fix working on your credit rating in the background; we can help navigate you through your bankruptcy faster and more efficiently while insuring that your rights are being respected and you are being represented fairly. Once you are discharged, from your bankruptcy, we will be there to help rebuild your credit in a prompt and responsible manner. Check out our Credit Slab program; your perfect bankruptcy companion! Imagine, rebuilding and improving your credit rating even while in the process of bankruptcy! Consumer Proposals – The Solution For You? What exactly is a consumer proposal , and could it be the right solution for you? Nothing seems simple when you're dealing with money problems. It's important to know that help is available, and understanding your options is the best place to start. Basically, a consumer proposal is a contract that's negotiated with your creditors on your behalf, by a consumer proposal administrator (also called a trustee). A legally binding agreement is put in place to arrange for a partial repayment of your total unsecured debt owing. You'll pay an arranged portion of what you owe, agree to a fixed term and interest rate. Ultimately, your creditors will agree to ignore the balance owing and agree not to sue you, obtain garnishees or pursue any other legal procedures. If you would like information about consumer proposals, your first step is to contact us and we will arrange an appointment with a debt expert. He or she will discuss with you the benefits of submitting a proposal, your responsibilities, and determine if you could qualify. There's no need to hesitate, as the longer it takes to get your file rolling your credit will continue to deteriorate, and you'll walk away with trusted advice from a professional the area of personal debt reduction. 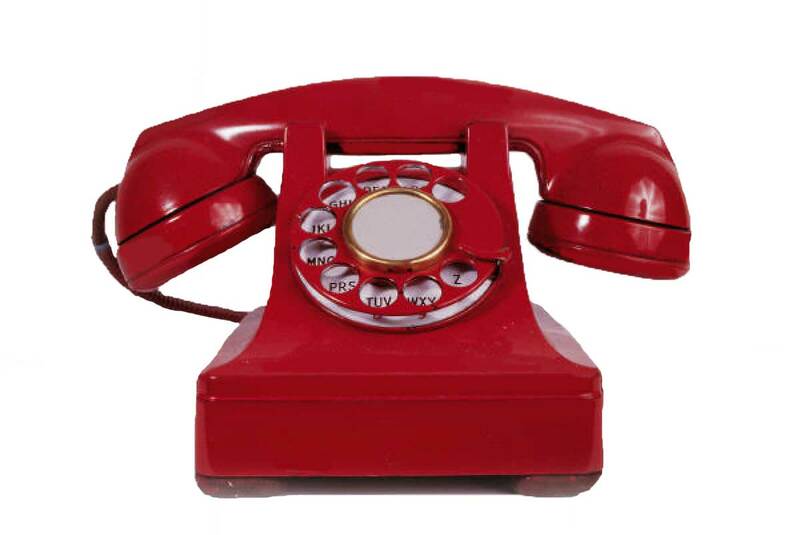 Collection companies and creditors can no longer contact you for payment; it's the law! Typically the Trustee does not work for or represent you. Canada Credit Fix can assist you and your Trustee so that you can land back on your feet in the best possible credit position. The Credit Counsellors and Trustees we work with will allow us to assist and advise you on matters involving your credit reconstruction leaving you in an improved credit situation once your Consumer Proposal is completed. Is your bad credit catching up to you? Are you sick of the collectors calling, and harassing you and your family? Debt Services can help you make it stop NOW! Bankruptcy may leave long term scars and damage to your credit report. These blemishes may continue to report for 6 to 7 years and even longer in some cases. The Bankruptcy Trustee DOES NOT represent you. Debt Settlement companies typically work for you directly in solving your debts and dealing with your creditors, but typically do not do credit repair. While working directly with your debt solutions provider we may be able to assist with revisions and restoration to your credit report. All those errors preventing you from getting new credit or that consolidation loan could simply vanish! Most of our members that utilize our debt settlement partners typically land on their feet with great credit up to 90% faster. However, bankruptcies generally do not affect the rights of secured creditors, i.e., those who have a valid security against your property, such as a car or a house. 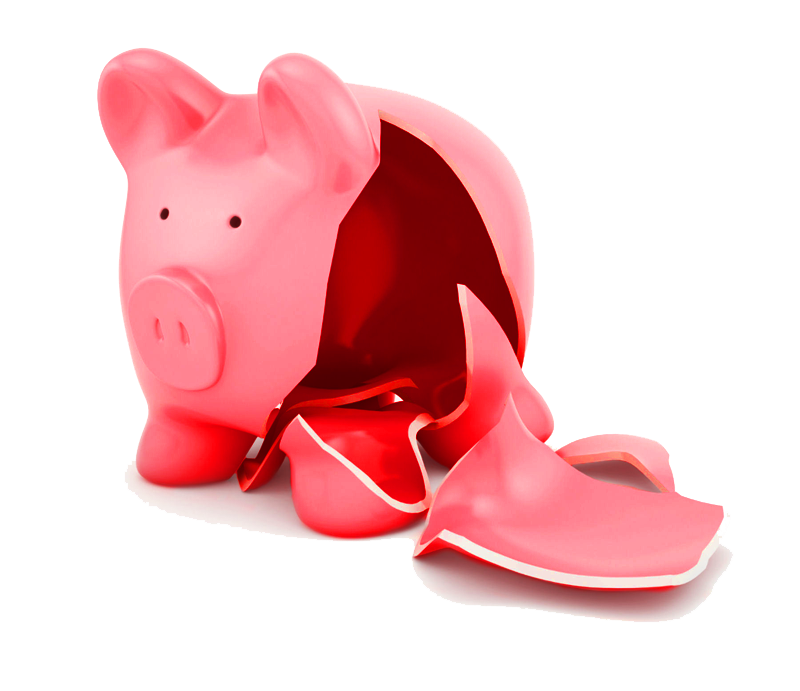 A bankruptcy can be filed through a trustee in bankruptcy, an individual licensed by the Office of the Superintendent of Bankruptcy (OSB) to administer the bankruptcy process. Note: Your own bankruptcy does not affect the liability of anyone who guaranteed or co-signed a loan on your behalf. Your spouse, for example, may be accountable for liabilities incurred jointly with you. It is, therefore, important to make the trustee aware of joint liabilities. 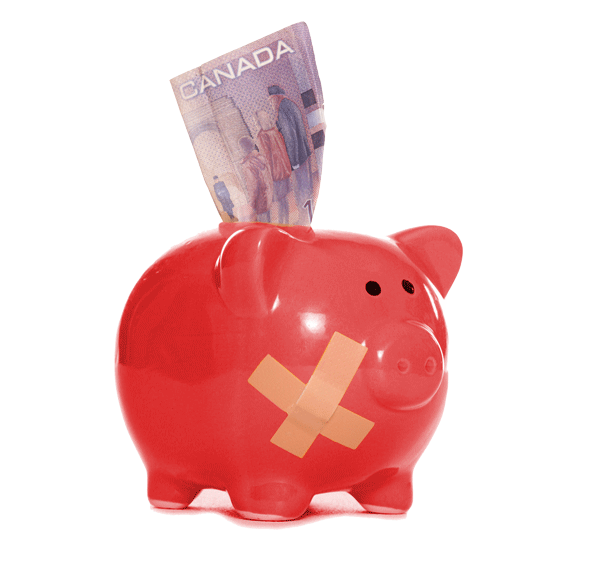 Typically, filing bankruptcy in Canada is a very negative process and will leave you with bad credit. We only recommend Bankruptcy and Insolvency are a last resort measure and will almost always try to help our members avoid bankruptcy as much as possible. That being said; we encounter unfortunate situations where bankruptcy is simply the best option and our member may not have any other viable choices. The good news is this: Not all bankruptcies in Canada are created equally and certainly not all Trustees are created equally. In the event that your best option is to file a bankruptcy; Canada Credit Fix will work with you directly and your Trustee to insure you can be released and discharged as soon as possible. Canada Credit Fix will work with you and your credit report to insure that all errors and incorrect data is purged or removed during and after your bankruptcy. Once you are legally allowed to obtain new credit, Canada Credit Fix will assist you with rebuilding responsible and affordable credit. Canada Credit Fix will complete all required credit restoration and insure your discharge is filed properly to both Equifax and Transunion and insure that your credit score and credit rating are reflecting properly. Getting you through your bankruptcy faster and protecting your credit rights is exactly what Canada Credit Fix is all about. Ask us to recommend one of our Bankruptcy Trustees in your province. You might be paying off a couple of credit cards, a line of credit, your Bay card, a Payday loan company, and who knows what else. It happens – especially during or after a recession – things can get out of hand pretty quickly. All of these bills have different interest rates – some of them as high as 173% (for payday loan places) – we know, it’s insane. Even Visa and MasterCard nail you with 29.99% or higher. No one should be paying this kind of interest and it is simply financial quicksand. Interest piles up and month after month you get nowhere! A consolidation may lower or eliminate the interest of your debts and best of all you may only have one bill to pay. Instantly, that monthly payment is lower than what you were paying before and you can quickly get back on your feet. We are here to get you back on your feet and help to pull you out of the quick sand. 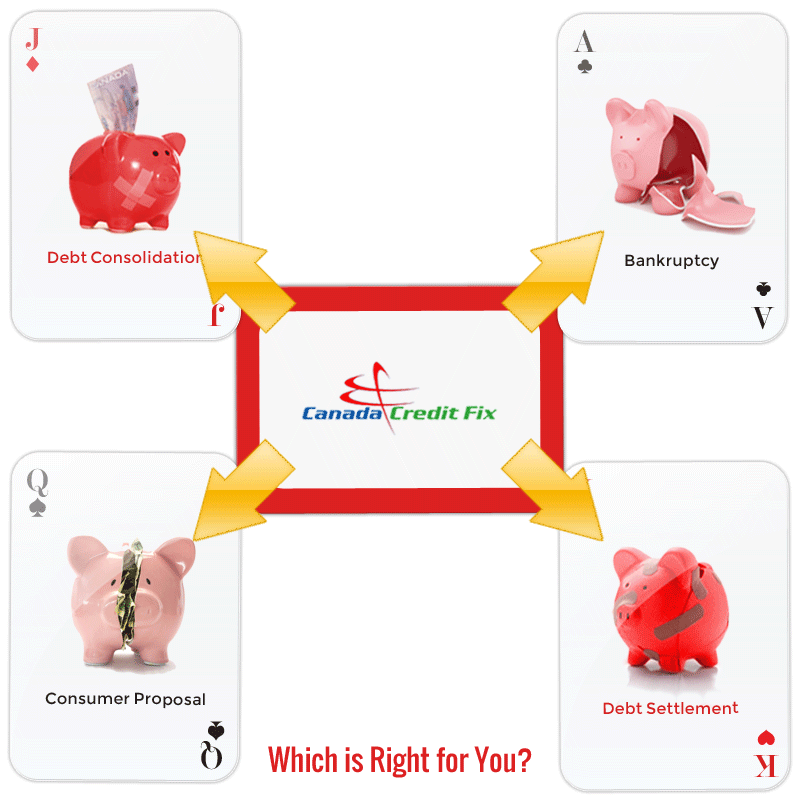 Canada Credit Fix will work you and help you find the right company to assist you with your debt consolidation. Many of our Partners are mortgage brokers, banks, finance companies and even private investors. We will point you in the right direction and help you get back on your feet!